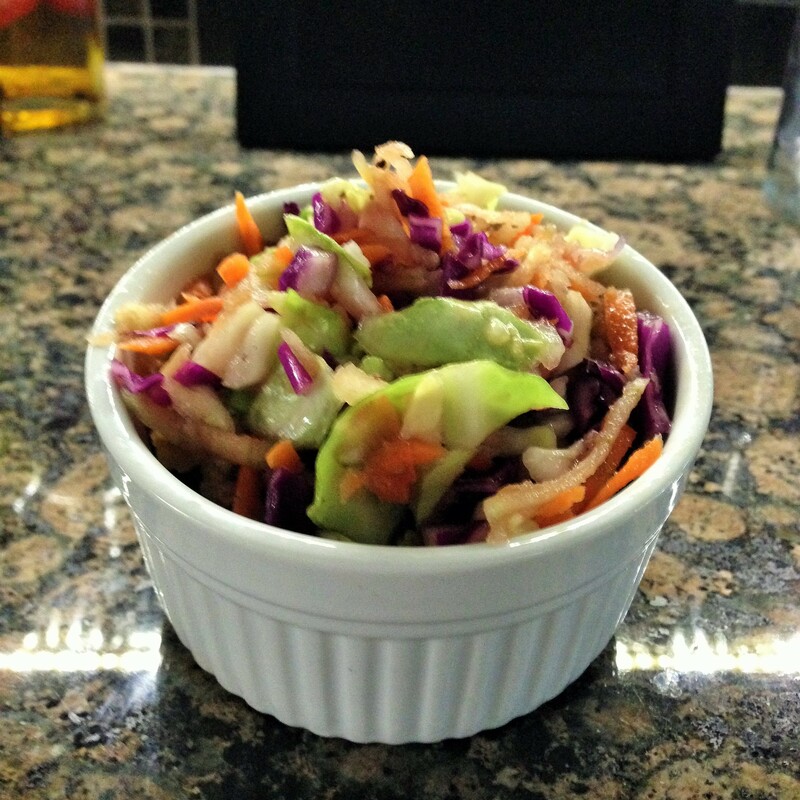 Guilt-Free Skinny Coleslaw – This Girl Loves to Eat! I’m just getting ready to throw a whole chicken into the oven for tonight’s dinner. I’m going to serve it atop a pile of fresh spinach sautéed in a splash of olive oil and some minced garlic and alongside one of my favorite recipe creations: Skinny Coleslaw. I can eat it by itself as a healthy mid-day snack, pile it inside a wrap with leftover chicken, serve it alongside grilled bratwursts, and, if I decide to spoil/treat my family, it’s even great piled inside a pastrami or corned beef sandwich. The longer the leftovers are in the refrigerator the better it tastes, so if you can make it a day ahead you are really going to taste all of the flavors at their best. Nutrition information per 1/2 cup serving of this homemade pleasure makes it something that I can eat all week and feel no guilt about at all! Chop the Cabbage, Grate the Carrots & Apples into bowl with a lid. Add the can of Crushed Pineapple & the Celery Seed and toss to combine. Cover and refrigerate. In a small saucepan, combine the Oil, Honey, Vinegar, Mustard, Garlic Powder, Salt & Pepper. Over medium heat bring to a boil then reduce heat and simmer for 3 minutes stirring occasionally. Remove sauce from pan, put into a shallow bowl and put into the refrigerator to cool (about 30 minutes). Once dressing is cooled, combine with the cabbage mixture and toss to combine. Cover and return to the refrigerator to chill until serving. Posted on November 4, 2015 November 3, 2015 by ls1228Posted in Gluten Free, Low Carb, Low Fat, Paleo Diet, Side Dishes, SkinnyTagged bratwurst, coleslaw, corned beef, gluten free, guilt-free, low cal, low carb, low fat, paleo friendly, pastrami, skinny, whole chicken.